Shopping for high quality fixtures for your home should never have to be a hassle. With Intex Windows & Doors, it will not have to be. You can find a great variety of Windows In Glendale from a distribution company that you can depend on to help you every single step of the way. Though we are based out of Glendale, our service range covers Los Angeles and the greater surrounding areas. Over the last decade, we have proven ourselves time and time again to the many customers around Glendale who we have been able to assist in a wide capacity of ways. You are going to be amazed when you learn of what we have done for the past 10 years, and how we are planning even more to strive for excellence when it comes to customer service, superior products, and the training of our installation technicians. It is important to us that every one of our employees has the know-how and experience to help our customers, as well as making an effort always to be compassionate and resourceful. You should have an easy time when you are shopping for your windows, doors, and the hardware that can be combined with them to make them even better – and that will be the case when you go through Intex Windows & Doors to shop and make your purchase. We love to help bring your dreams of beautiful and superior design solutions come to life. Search through the catalog, and you should come across something that is well suited to your needs. It certainly is easy to navigate, with a user friendly search bar and the categories all laid out clearly. There are numerous color photos to bring these fixtures clearly into focus for you, so that you do not entirely miss out on that in-person experience since you are not at the store or warehouse. Isn’t it great to be able to shop from anywhere you wish? When you want Milgard Ultra Woodclad Windows In Glendale, look no further than what you can find at Intex. We have been a major distributor for this brand for years, and take pride in that fact. This leading brand has masterful craftsmen who create their products in a consistent manner, so you know you will get a fixture that is up to high standards. The Woodclad series is in a class all of its own, meaning that it has beauty, grace, and it is functional. It is perfect for classic settings, as well as more modern ones. No matter the style of your home, you likely will love the Ultra Woodclad windows from Milgard. The lines are cut beautifully, and they are energy efficient as well. These windows meet the ENERGY STAR standards, and as a result are among the best out there for families who are environmentally conscious. When you need to have top notch Windows In Glendale that will serve you well over the years, they are a great choice. You also get to take advantage of the full lifetime warranty that is offered with our products. If something arrives to you in less than the condition that you were promised or it breaks at no fault of your own, we will make sure to refund the money you spent or provide you with an exchange of a comparably priced product. When you are ready to order or start shopping, contact Intex Windows & Doors for assistance with any questions that you may have, as well as to request that you receive a free on-site estimate. It's always a good time to shop from a company like Intex Windows & Doors, which is a family-run business and has been around for many decades. Through the decades since their inception, this company has developed high standards of excellence to be able to assist a broad customer base from the Glendale area. If you are in the market for some beautiful Windows In Glendale, you should seek out what you need from Intex. Not only are the prices right, but you can find an array of styles, sizes and materials making up these high quality windows that you will need to see to believe. You can view the catalog of choices easily by searching the categories based on what you want. If you are thinking of something that is not offered by our company, you're welcome to talk to us about personalizing some windows to fit your house or commercial property. This is convenient to do and you surely will be happy with the outcome of what you order. We really would love for you to look around and read the testimonials to see what our previous customers have said about their experience with Intex, so that you feel more comfortable making the decision to purchase from our stock. Intex Windows & Doors sells a great deal of options of Windows In Glendale. We sell products from brands that are well known throughout the area, such as Milgard, Jeld-Wen, and Fleetwood. Each of the products have their own beauty, though certain ones will be suitable for the architecture of your home or the purpose that you have in mind. We sell to both residential and commercial customers, making our company one of the more versatile around. If you have a concern about saving energy, we can supply you with window fixtures that are made to the finest ENERGY STAR standards. They are geared towards keeping the interior of your home maintained at a certain temperature by crafting them to fit the unique qualities of the local climate. This is not something that is made available by all companies, so you should take advantage of the fact that you can purchase these stylish yet practical windows and many other fixtures from Intex Windows & Doors. Your new windows definitely will impress your neighbors and guests with their charm and amazing construction. Do you want to buy Commercial Windows Los Angeles for an office building, store, or other place of business? You're in luck, because here at Intex we also sell a large selection of these products that are designed specifically for the commercial sector. You can get them at a reasonable price, and enjoy the value of impressive windows that will last for a long time. One style that we especially have taken care to craft in many varieties is the storefront window. You can find all glass, paneled, frameless, arch top and others that will brighten up the appearance of your building. Passersby are sure to want to stop and see what your business is all about when they notice the beauty of the exterior. A great storefront is crucial to any store, though it is necessary for a department store or other business in which you want to put items on display to showcase what you are selling. Don't leave this up to chance, as not just any company can offer you the same quality and beautiful craftsmanship as you will find with Intex. If you need new or replacement doors or windows for commercial purposes, we will do our best to bring you products that meet your exact specifications, even if that requires customization if we do not have anything comparable to what you want. Superior service from knowledgeable and caring professionals is what you'll get when you shop from Intex. Good quality windows have a stunning finish and visually entice the viewers. Opt for a window that enhances the aesthetic appeal of your home. Certain windows can make rooms and houses appear more spacious than they are. Colors also play an integral factor in enhancing the overall look of your house. While white windows give off a sophisticated look, shades of beige and grey are also great options. The style of the window has to blend well with the architecture of your house. While gliding windows display a more modern look, double-hung and half-moon window give off a classier vibe. It does not matter if you purchase the best window in the world if it is installed incorrectly. You will experience numerous problems over the years. Incorrect installation may lead to air and water leaks, resulting in energy wastage and electricity bills. Opt for a reputable window brand that has a good installation team. Not only will you personally get to know the installers but your house windows will be backed by the company that sold the windows. Apart from fiberglass and aluminum, consider installing wooden windows. Wood is among the most common materials utilized in residential windows today. Not only is the material incredibly versatile but it also possesses an attractive appearance and is durable in nature. Looking for new windows in Glendale? Shop at Intex and take advantage of the number of discounts and specials our store offers. 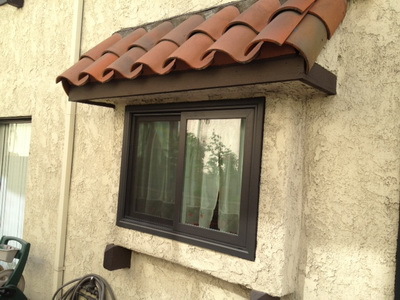 Are you looking for some high quality Windows In Glendale to replace one or more that has become broken? If so, then Intex Windows & Doors is here to help. We are a renowned authorized dealer for the Glendale area, and we have become a trustworthy, successful company with many clients. If you are in need of immediate Replacement Windows Granada Hills, shop our large selection from the different categories that are displayed. When you see just how many types and how attractive the styles are, you are not going to want to shop anywhere else in the future. In addition to the different Series of windows, we have several types of doors, both interior and exterior for commercial and residential use. You might be surprised to find that we have something to fit your unique needs. If you would like to have a finely crafted door of your own, then you can have a look at our Simpson doors. They are gorgeously handcrafted and you can get either a standard or customized door. It is sure to be impressive and to stand the test of time. These doors have been made for the past century, so you know you will be receiving a quality product that many people love. We bring you this along with the Replacement Windows Encino and numerous other products, so that you do not have to travel to different stores or visit multiple websites when you need to outfit your home or are building a new house. It is so important to know exactly what you are getting for Windows In Glendale. If you are interested, give us a call and set up an appointment to have an in-home estimate that is free. We welcome you to request our installation services and ask all questions you may have before you order.